Size: 47 x 57.8 cms. 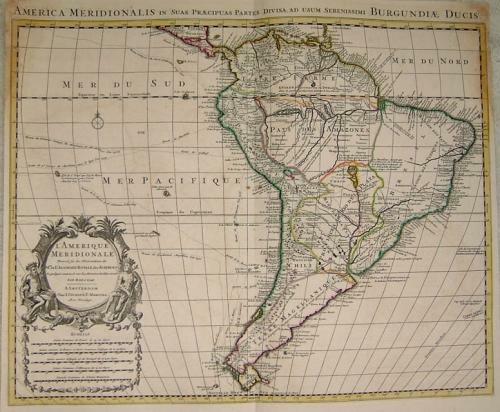 A detailed map of South America prepared by De L'Isle with a fine cartouche. It is a comprehensive study of South America as known to Europeans at the start of the 18th century, much of the interior still remained to be discovered, but coastal regions are well documented. The mystery of this map is the odd turn to the west that the Chilean-Argentinian peninsula takes. The map is printed on heavy paper and is in good condition. There is some marginal discolouration as can be seen in the picture.